A one-day Hell Serpent Rising Over Kyiv: Act III festival will take place for the third time in Kyiv, Ukraine, on February 9. The event will feature the Polish group Azarath and the German act Pripjat, as well as Ukrainian bands Hell:on, Stryvigor, and Depth. Azarath (PL). 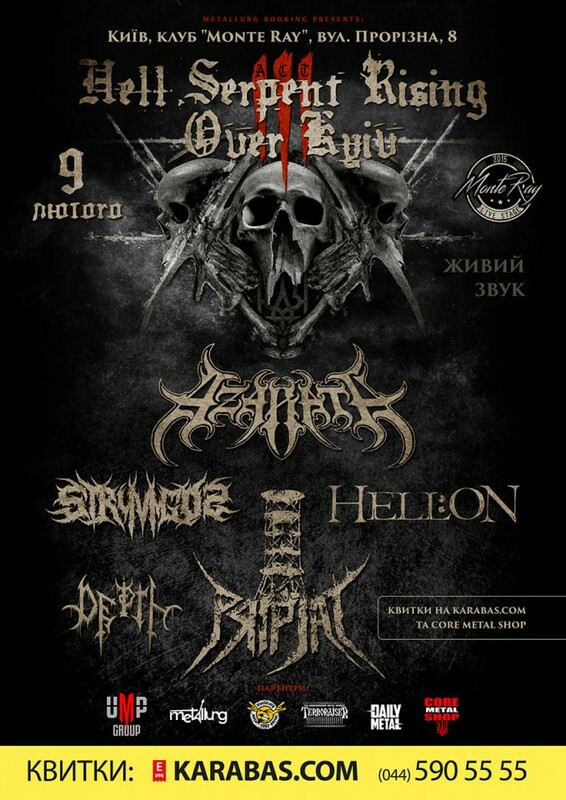 For the first time in Ukraine! One of the oldest bands of the classic Polish death/black metal scene. The group was co-founded in 1998 by Inferno, a drummer of the world-famous act Behemoth. In February, the band will present their 2017's album "In Extremis". Pripjat (DE). The group from Cologne, Germany, was founded in 2011, but during this time already became one of the most promising acts of the Teutonic thrash metal scene! At the festival, Pripjat will play songs from its latest 2018's record "Chain Reaction". Hell:on (UA). One of the most famous Ukrainian death/thrash metal acts. Unspired shaman singing mixed with classic hard-hitting metal! In Kyiv, the band will play a new program with tracks from the upcoming album which will be release later in 2019. Stryvigor (UA). Powerful atmospheric black metal from Khmelnitsky. At the concert in Kyiv, the band will play material from its new 2018's release "Lifelong Journey". Depth (UA). Young band of Kyiv black metal scene. The visitors of the upcoming festival will be able to hear tracks from Depth's debut record, which is scheduled for release in 2019.